McBASTARD'S MAUSOLEUM: Pinhead and the Cenobites return in Hellraiser: Judgment (2016) - coming to Blu-ray and DVD on February 13th! 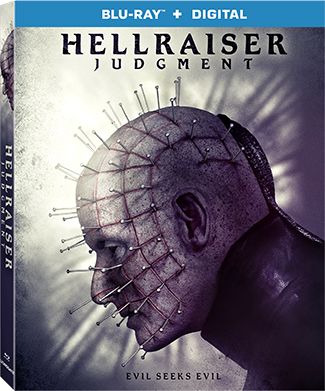 Pinhead and the Cenobites return in Hellraiser: Judgment (2016) - coming to Blu-ray and DVD on February 13th! Experience a terrifying new chapter in the legendary Hellraiser series when Hellraiser: Judgment arrives on Blu-ray™ (plus Digital), DVD, Digital, and On Demand February 13 from Lionsgate. The tenth film in the classic horror series tells the story of three detectives as they struggle to solve a horrifying murder, but instead find themselves thrust into the depths of Pinhead’s hellacious landscape. Including horror icon Heather Langenkamp (A Nightmare on Elm Street, Wes Craven’s New Nightmare), and written and directed by Gary J. Tunnicliffe (Hansel & Gretel), the Hellraiser: Judgment Blu-ray and DVD will be available for the suggested retail price of $21.99 and $19.98, respectively. Title Copyright: Hellraiser: Judgment © 2016 Puzzlebox Returns, Inc. Artwork & Supplementary Materials © 2018 Lions Gate Entertainment Inc. All Rights Reserved.